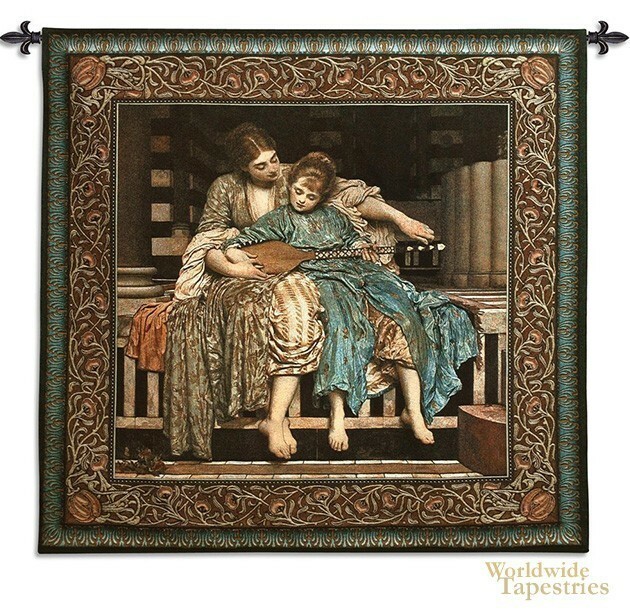 This tapestry "The Music Lesson" is based on the work of Lord Frederic Leighton (1830 - 1896). His works were based on historical and classic subject matter and in this tapestry we see a classic rendition of a music lesson with a 19th century edge. Here we see a girl having a lute lesson. The flowing costumes of the lady and girl are flowing together to create a palette of blue and olive greens and patterns. There is a soft light on the subject matter combined with this subdued yet balanced use of color which gives the scene a delicate and soft quality. There is a classic Renaissance feel to this work, yet with a slightly new feeling that is a hallmark of his works. This art tapestry "The Music Lesson" is backed with lining and tunnel for ease of hanging. Note: tapestry rod and tassels, where pictured, are not included in the price.